Birding fever hit a high this past weekend in natural areas throughout northern Illinois. Birders flocked in throngs with binoculars strung on their necks like potential Olympic medals and a hope of spotting some of the most coveted migratory birds— wood-warblers. 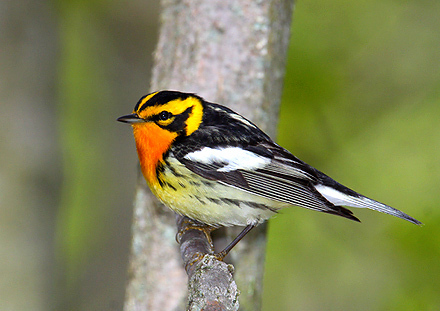 Members of the family Parulidae, wood-warblers are the colorful jewels of migration from the sapphire blue of a cerulean warbler (Setophaga cerulea) to the amber orange of a Blackburnian warbler (Setophaga fusca). Yet, as these birds flit about in the treetops, no color is as visually striking as the lemony-yellow citrine that adorns so many warblers as they pass through our area on a flyway. Once these impish birds reach their destinations (as far as northern Canada for some species) and breed, they will molt their flamboyant plumage and become far less conspicuous, which is why seeing them in the spring is considered such a prize for birders. The Wilson’s warbler (Wilsonia pusilla) is one such bird that makes a ridiculously long trek from its wintering grounds in the tropical high plains of Central America to the tundras of Alaska and Canada, stopping in our area only long enough to nab insects to fuel its flight. Once they reach their northern destinations, these warblers will build a ground nest lined with grass or hair. The yellow warbler (Setophaga petechia) is one of the easiest warblers to identify due to its uniformly bright yellow color, unmarked face and large black eye. 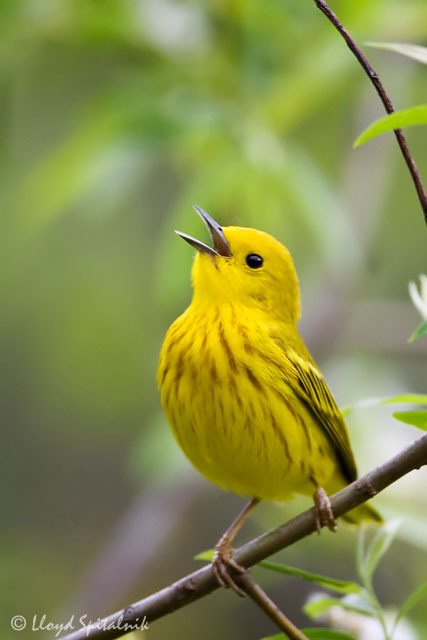 Male yellow warblers loudly whistle a series of notes so beautiful they seem to say, “Sweet, sweet, sweet—I’m so sweet!” This species is known to nest in Lake County, Illinois, building in the forks of small trees such as hawthorns and dogwoods. Like most songbirds, warblers migrate at night, dropping into an area to actively feed on insects in the wee hours of dawn. Their journeys can sometimes involve non-stop flights of more than 1,000 miles! They prefer healthy, mature woodlands such as those found at Edward L. Ryerson Conservaton Area and Captain Daniel Wright Woods and tend to move in waves with many species flocking together. Because of their small size and flitting behavior, it is often easiest to see these warblers along clearings or edges of woodlands. 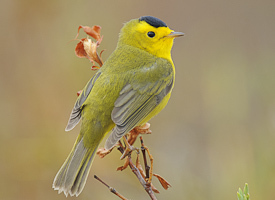 Often bird watchers will hear a warbler’s melodious call without ever laying an eye on the bird. These birds can be confusing and frustrating to identify. 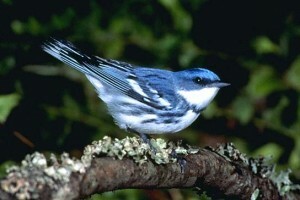 Joining a Lake County Forest Preserves bird walk is a great way to get started. Check out the Illinois Ornithological Society’s birding calendar for a list of bird walks, talks and events around the state. It is at this time of the year that I often find myself in an overwhelming flurry, encountering just as many birders as birds themselves. When the warbler songs and the ruckus of fellow birders reach fever pitch, I lift up my binoculars to see a singular magnolia warbler (Setophaga magnolia) through the lens. I feel a stillness return inside myself just long enough to admire his black mask and a splash of egg-yolk yellow before he is gone. This entry was posted in birds, nature, wildlife and tagged birder, birding, birdwatching, Blackburnian warlber, cerulean warbler, flyway, Lake County Forest Preserves, migration, ornithology, Parulidae, Ryerson, Setophaga, spring migration, warblers, Wilson's warbler, wood-warblers, Wright Woods, yellow warbler by lakecountynature. Bookmark the permalink.